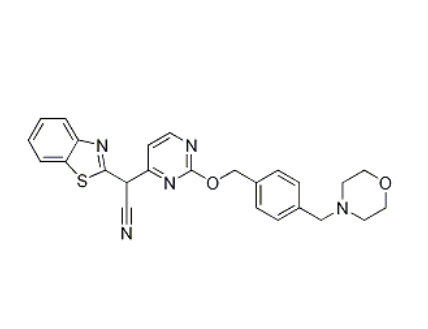 AS602801 CAS 848344-36-5, also known as Bentamapimod and PGL5001, is potent a JNK Inhibitor. Experiment shows that AS602801 CAS NO 848344-36-5 can blocked T-lymphocyte proliferation and induced apoptosis. In addition to this, AS602801 can also induces regression of endometriotic lesions in animal models. The AS602801 CAS 848344-36-5 is soluble in DMSO (10.8 mg/ml), and 0.1N HCl (aq.) (44.4 mg/ml), but not in water. The purity of it more than 98%, and the boiling point is 666.5 °C at 760 mmHg. We can offer the AS602801 in a proper package to appointed destination. Looking for ideal Bentamapimod Called AS602801 and PGL5001 848344-36-5 Manufacturer & supplier ? We have a wide selection at great prices to help you get creative. All the Kinase Inhibitor AS602801/ AS-602801/ AS 602801 CAS 848344-36-5 are quality guaranteed. We are China Origin Factory of PGL5001 CAS 848344-36-5. If you have any question, please feel free to contact us.